Hey y’all! 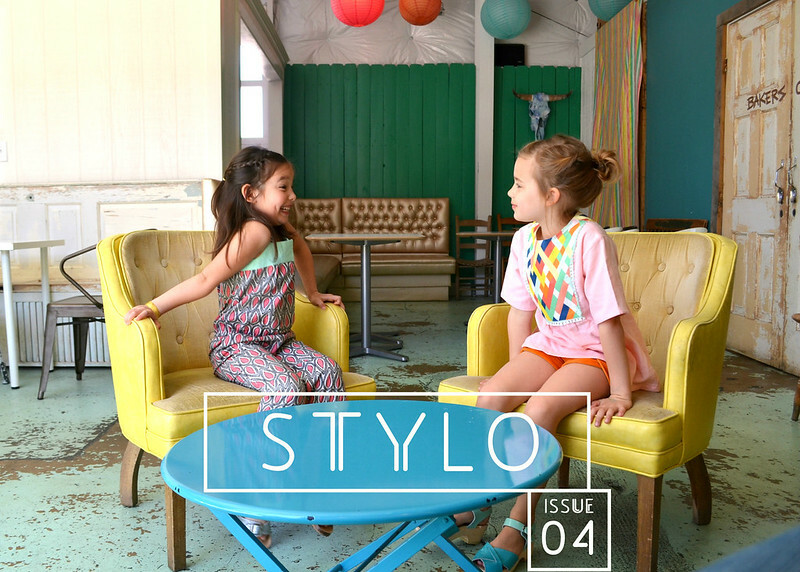 We’re back to talk about our second look for STYLO. This one was really fun because we sort of threw the instructions to the wind and just let the girls hang! We shot the other look that morning at UVA, had a quick lunch in the cafeteria there and then hopped across the street to a great Charlottesville treasure, Sweethaus. Not a soul was in the shop at 2:00, so the girls had the whole adorable place to themselves. 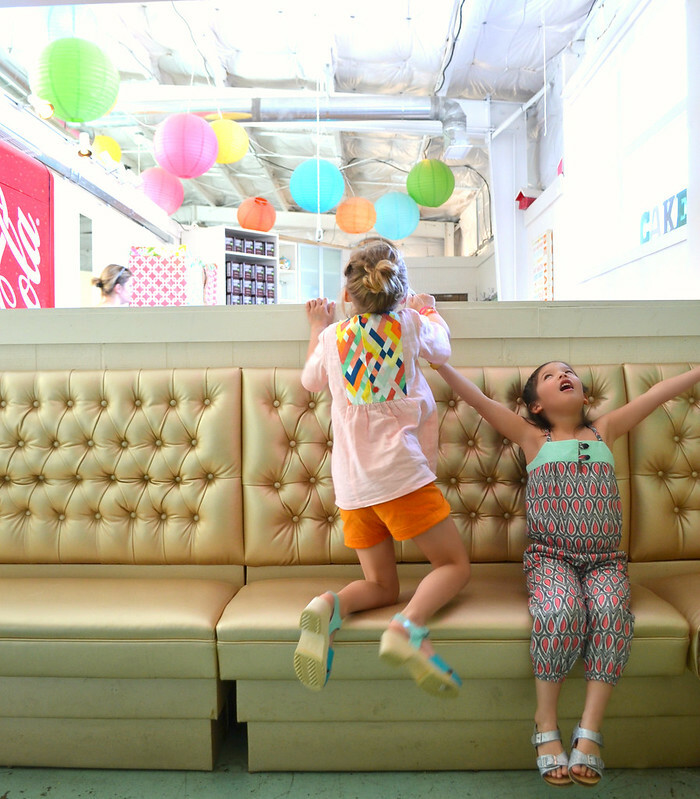 They were silly, happy, and high on sugary treats! For this look, we wanted to be fashion-forward, but really true to our styles. We wanted to make clothes that were comfortable, but also cool. We wanted to use colors and prints that popped, but weren’t outrageous. 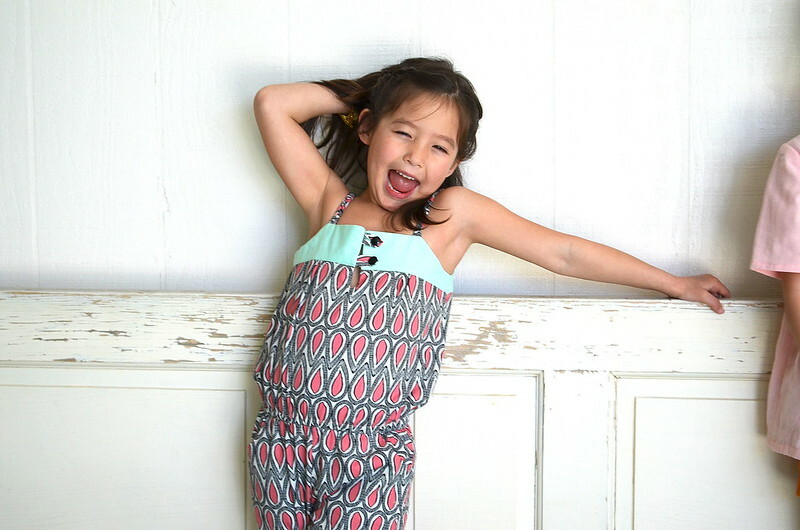 For Avery, we used the Figgy’s Zephyr romper pattern but extended the legs- going for a more modern jumpsuit take on it. 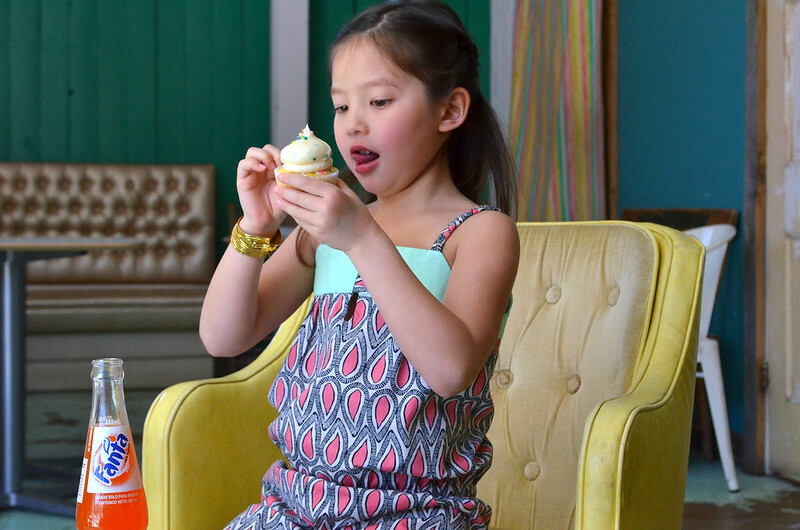 Rompers on a 5-year old can either go one way or another- we didn’t want this falling into babyish territory! We fell in love with Pat Bravo’s Etno line, and were kindly sent two yards of this really great print, Drops in Pamplemousse. The bodice is Cotton Couture in Seafoam. Her glittery silver sandals are from Target. 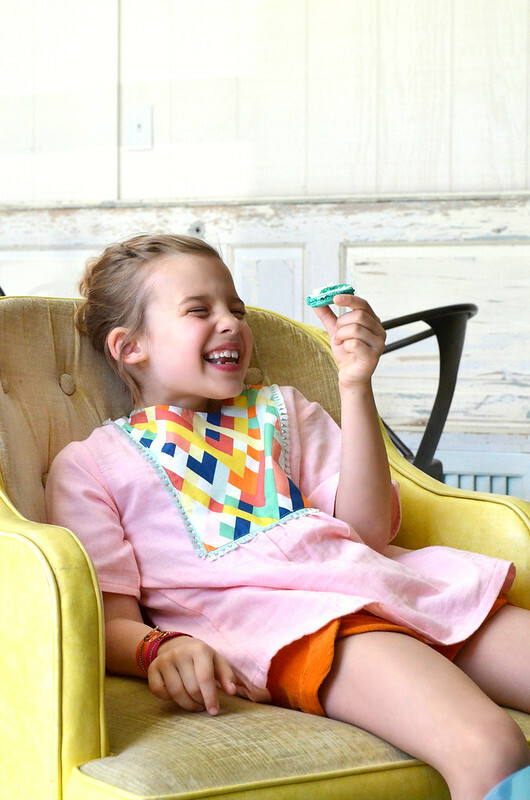 For Ellery, we used two Oliver + S patterns. 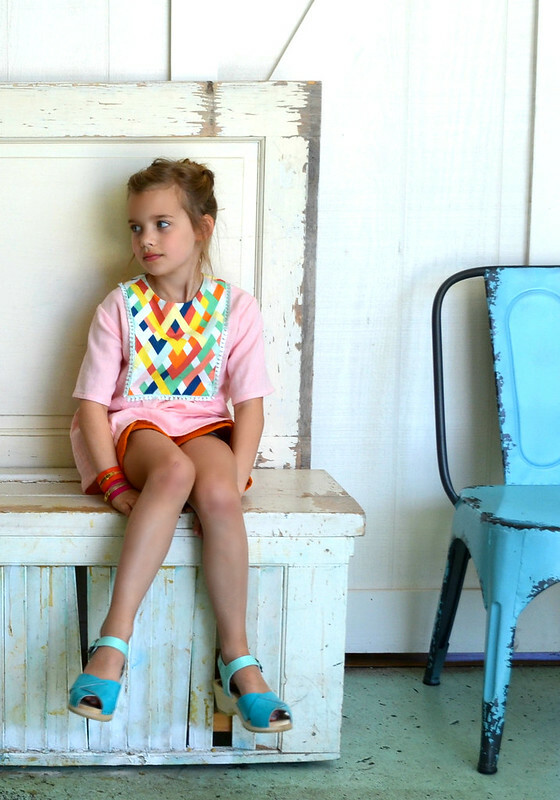 For the hide and seek tunic, we used Cotton + Steel Bespoke double gauze in peach for the main fabric. For the yoke, we used a lovely printed voile by Avril Loreti for Cloud 9 which they generously provided to us for this project. The mini mint tassel trim is from this etsy shop. Ellery’s class picnic shorts are made with this awesome Italian Corduroy from Joann- it’s got a different texture than regular corduroy- almost velvety. Her Swedish clogs are by Hanna Anderson. 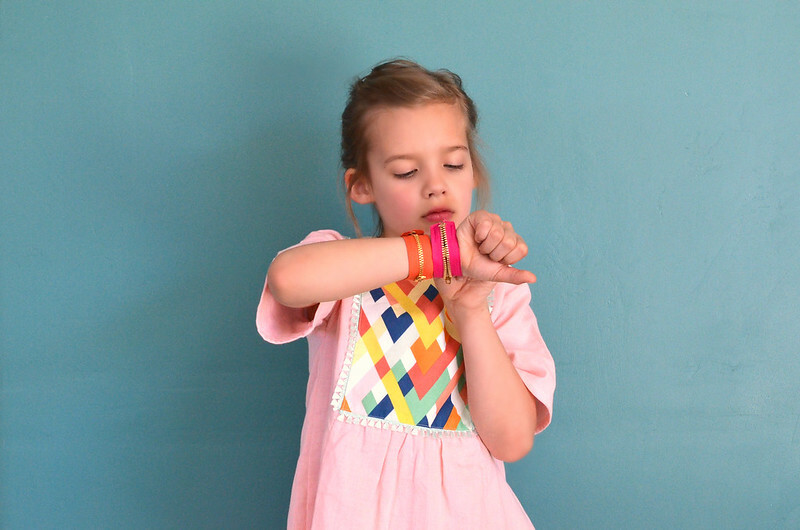 For the zipper bracelets, we just sewed Velcro squares to the ends- so easy. Not gonna lie…STYLO consumed us for a while. We went through phases of loving our ideas, getting a little unsure, and sometimes throwing them to the wind (We’re talking to you, black suspenders!). In the end, we just stuck to our guts and made what we wanted to make. And we couldn’t be happier with the result. Thanks again to Jess and Celina for this opportunity! It really pushed us (and our decision-making skills) to be better, and to nail down our point of view. You guys are the best. I love this. and I love you, T-Hizzy! LOVE. So happy and fun but not over the top! You guys are so good. I love these clothes, but you also have a great eye for finding cool photoshoot locations. Both locations are perfect for this issue! Totally love. Also, I want Ellery’s outfit for myself. Love the yoke/closure on Avery’s jumpsuit. I meant “bodice” and closure. The outfits are gorgeous, and it is evident the photo shoot was fun! Hugh on sugary treats… hmm…. Suuugarrrr!! !